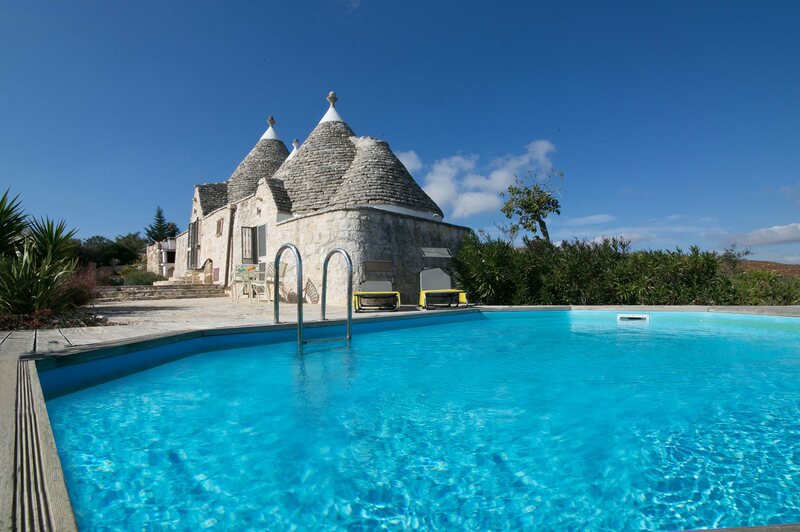 Trulli Isabella is an authentic 1 double bedroom property with a private pool, ideal for a romantic getaway. It's located on top of a gentle hill, overlooking the Valle D'Itria and securing fantastic views over the Pugliese landscape. This setting is best enjoyed whilst laying by the pool, dining alfresco under the gazebo or enjoying an apertivo whilst relaxing on the outdoor seating area. WiFi, pool heating and air conditioning/heating in the bedroom are included. The setting of the trullo overlooking picturesque countryside towards Locorotondo making a great couples' escape plus the character of the traditional interiors. The swimming pool is surrounded by decking and plenty of space for relaxing on the sun loungers with a good book. It overlooks the characteristic Pugliese landscape, dotted with olives trees, fruit trees and Mediterranean shrubs. The BBQ, and the gazebo with a dining table and chairs is the perfect place for sampling the local food and wine. You'll also find scented herbs growing in the garden. Trulli Isabella is situated at the end of a country lane with gated access to the property and a large parking area. From here, a flight of uphill stone steps lead to the terrace where there are 2 doors, one leading to the kitchen/living area and other directly to the bedroom. The living space is inviting and fully of character with its open stone walls and curved ceilings. It's furnished with a sofa, coffee table, dining table and chairs with a fully equipped kitchen to one side. There's also access to the terrace. There is 1 double bedroom set under one of the roof cones with an impressive high stone-ceiling and ample storage space in the wardrobe and chest of drawers. You also have direct access to the outside space. This bedroom is connected to the shower room via a few steps. You do not need to take a long road trip if you want to explore most of the fascinating historical centres of the Valle D'Itria. Martina Franca is only 15 minutes' drive away, whilst both Alberobello and Locorotondo are easily reachable in under 30 minutes. What's more, Savelletri is about 45 minutes away by car where you can experience amongst the best fish restaurants along the coast, as well as discover the beaches. The nearest supermarket is about 10 minutes' drive away for your essential supplies. You can also find great produce in the local green grocers, butchers and fishmongers. Every Wednesday the market takes place in Martina Franca, where you can find local fruits and vegetables, shoes, clothes, handbags and much more. The centre of this town also offers more shopping opportunities. The typical Italian 'Rosticceria' offer you a great variety of local meat, including the mixed grill which always comes with baked potatoes and salad. These, along with several restaurants and pizzerias, can be found in the historical centre, as well as bars and wine shops where you can try the local food. One of the oldest cafes in Puglia is in the heart of Martina Franca and has a small outside terrace perfect for people watching. Martina Franca is only 30 minutes' drive from the Adriatic Coast, where the shoreline alternates between rocky coves and small sandy bays. From the imposing cliffs of Polignano to the gentle sand dunes south of Torre Canne, there is something to suit everyone. If you are heading to the coast, the best place to sample the fish restaurants is Savelletri, which is the closest beach to Trulli Isabella. The Egnazia Waterpark close to Monopoli and Zoosafari Fasanolandia, a safari and theme park both make a great day. There is also horse riding available at the Centro Ippico Parco di Mare in Fasana. Alberobello is 30 minutes away by car, which is famous for conical-roofed houses - trulli which have UNESCO protection. It's a great place to wander around with its narrow pedestrianised streets, little shops selling local produce and souvenirs, plus some nice cafes and restaurants. Around the same distance away, you'll find Locorotondo in the Valle D'Itria, a green stretch of countryside also dotted with distinctive trulli. A little further afield is Ostuni, around 45 minutes' drive away, which is dubbed 'The White City'. It has a network of narrow lanes winding through white-washed buildings, past prestigious palaces and churches, and opening into piazzas. There are plenty of gift shops where you can pick up the odd souvenir too. The nearest course is the 18-hole San Domenico by the Adriatic Sea, which is considered amongst the best in Italy. The Grotte di Castellana are one of the natural wonders of Puglia, and you can take a full tour around the splendid caves lasting for around 2 hours. Villa Trulli Isabella is not available to book for season as it is sold out. Take a look here at the Puglia villas that are currently on sale. Venture underground to one of the region's many grottoes. The largest are at Castellana and Putignano with guided tours of the Grotte di Castellano taking up to 2 hours to see the whole 2 mile network of caves.